Bacon or pickles? Oreos or onions? Mac-and-cheese or cookie dough? 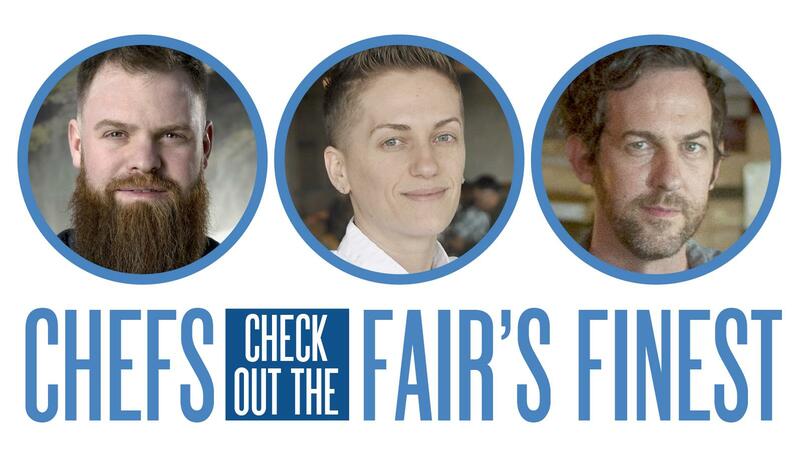 Kaba, the executive chef at the Spokane Tribe’s new casino restaurant, joined two other Spokane chefs – Tony Brown of Ruins and Chad White of Zona Blanca – for a quick tour Monday of the food options at the Spokane County Interstate Fair. The trio produce some of the best dishes available in Spokane’s current foodie moment, but that doesn’t make them immune to the charms of the humble corn dog. We gave them each 30-odd bucks and set them free. In a matter of minutes, White had his mitts on a deep-fried Philly cheesesteak and Brown was ordering Texas fries – a mound of french fries covered with cheese sauce and salsa and pickled jalapeno discs the size of hula hoops. Kaba, meanwhile, had scored a serving of deep-fried lasagna. White had picked the fried Philly as part of a kind of personal mission to find a good cheesesteak in Spokane. So that’s where we began, with first impulses and high hopes. A hundred bucks later, in a deep-fried stupor, trying to keep napkins from blowing away under overcast skies, we’d talked about the nostalgic appeal of fair food, the trend toward high-caloric stunt dishes – and the delights and disappointments of an afternoon’s worth of fair food. Fair food is as much about nostalgia as it is taste. White grew up in Spokane, going to the fair here with relatives who brought livestock every year. He said he loved all the classic fair foods – kettle corn, elephant ears, corn dogs – but recalls much simpler menus. A Spokane native, White opened Zona Blanca in 2016. Brown opened Ruins, with its innovative small-plates menu that changes regularly, in 2014. The restaurant is set to be featured on the Food Network show “Diners, Drive-Ins and Dives” this month. Kaba, on the other hand, grew up in Albania, and came to America with her family when she was 12. Her first fair experience was in New York, she said – at the continual “fair” that is Coney Island. She’s lived in Spokane for about five years, and is the executive chef at Three Peaks Kitchen and Bar at the Spokane Tribe Casino. Fair food has always been simple, fast, salty, fatty – leaning heavily on the many delicious fruits of the fryer basket. Nowadays, though, the offerings are often extreme, if not extremely silly. There are plenty of “normal” dishes, from salmon to noodles to barbecue, from gyros to rice bowls to ice cream. You could probably find a few vegetables, if you looked hard enough. An especially dedicated hunter and gatherer could probably cobble together a meal a cardiologist would endorse. Yet what you notice most as you walk through the booths is how many food items are almost daring you to eat them: A cheesecake-a-dilla! (a quesadilla with cheesecake filling). A grilled mac-and-cheese sandwich! A glazed donut burger! A cotton candy burrito! It’s stunt food for the Instagram age. By the time Brown, Kaba and White had spent their money and assembled their quarry on a picnic table, we had a representative sample of both the traditional and the newfangled: deep-fried lasagna and cheesesteak, a block of curly fries, a smoked turkey leg, a giant corn dog, Texas fries, an elephant ear and two piroshki – one sweet, one savory. White looked for a way to start eating his torpedo of a deep-fried Philly cheesesteak. “I don’t even know how to…” he began, sounding mystified as he tried to figure out where to bite. “Start?” asked Kaba, having a similar issue with her lasagna. Brown abandoned his Texas fries to go grab an un-deep-fried Philly cheesesteak. Then he and White evaluated the sandwiches, neither of which had Cheez-Whiz and neither of which put an end to White’s search for a good Spokane iteration of the sandwich. At the end of our afternoon meal, there were two unanimous favorites: the smoked turkey leg and the strawberry-cream cheese piroshki. The deep-fried lasagna that called to Kaba so enticingly was the least favorite. Some of the dishes suffered from a kind of slap-dash execution, the chefs said – too little salt, canned ingredients – and many were just kind of … fine. “Out of all the things we ate today, I would actually come back to the fair for the turkey leg and the piroshki,” White said. Brown and Kaba agreed. Kaba’s planning to return to the fair Wednesday with her partner and their four kids. Published: Sept. 11, 2018, midnight Updated: Sept. 11, 2018, 9:38 a.m.